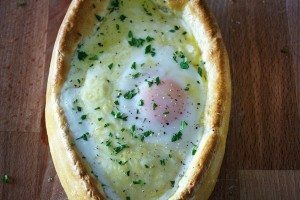 My first official 'we are going to pay you to cook' pastry job out of culinary school was for a traditional Italian restaurant opening up in midtown Manhattan. Being a brand spanking new operation, we had the best of everything: tools, appliances, and ingredients. I was a kid in a candy store. Everything was made from scratch. Fresh pasta made daily by hand. 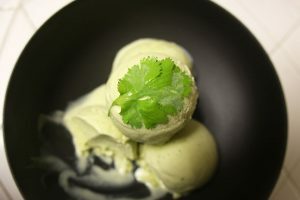 Basil sorbet made from basil purchased that morning at GreenMarket in Union Square. And I can't forget the house made mortadella, an Italian cured meat made of pork sausage and pork fat wrapped in the skin of a pig and poached. Seriously. The executive chef knew the whole carcass thing made me queasy, and would assemble it on the pastry station just to piss me off. One of the savory cooks that stood out to me I will lovingly refer to as 'Meat Girl'. The Meat Girl handled all the meat; marinating, curing, aging with precision, purpose and confidence. She marinated a pastrami for two weeks just for staff meal. The Meat Girl was also in charge of making the fresh ricotta. While assembling some bruschetta for a party, Meat Girl gave me a toast with the fresh ricotta on one side and oven roasted tomato puree on the other to taste. I had never had a ricotta such as this! Creamy, rich, flavorful. Having been used to those tubs in the supermarket of bland, grainy, watery ricotta, my eyes were opened. I always thought you had to have ricotta with other things to make it edible, like in a lasagna. This was great enough to stand on its own. It was no wonder they went on to earn a Michelin star. In the midst of a crazy kitchen, she gave me the parts but not the method. 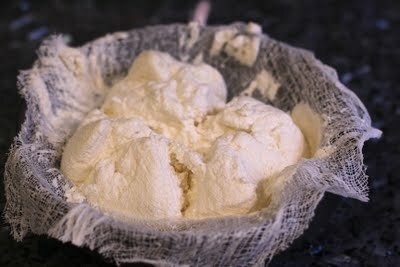 So with a little research and testing, the perfect formula for making ricotta at home materialized. And its uber simple. The flavor comes from the combination of goat's and cow's milk. There is no salt in this recipe so you could go either sweet or salty with how you use it. I added sugar and salt amounts at the end of the recipe. Prepare your draining set up: Place a colander over a large bowl. Bowl should be large enough to capture all the whey if you intend to reuse it for another batch (See note below for reuse). Line the colander with 1 layer of dampened cheesecloth. The cheesecloth must extend over the lip of the colander at least by 4 to 5 inches. Combine dairy in pot. Heat on low, stirring occasionally to prevent scorching. Do not boil. 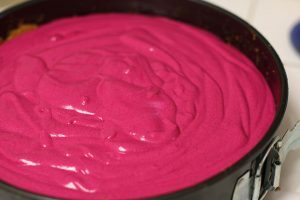 Once temp reaches 150F (66C), stop stirring. At 195F (91C), cook for 15m while the curds form. 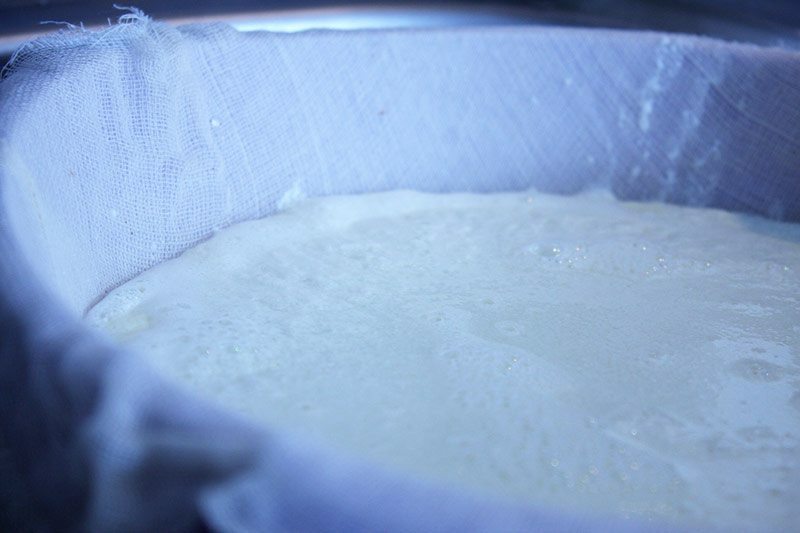 Pour curd and whey into cheesecloth slowly. 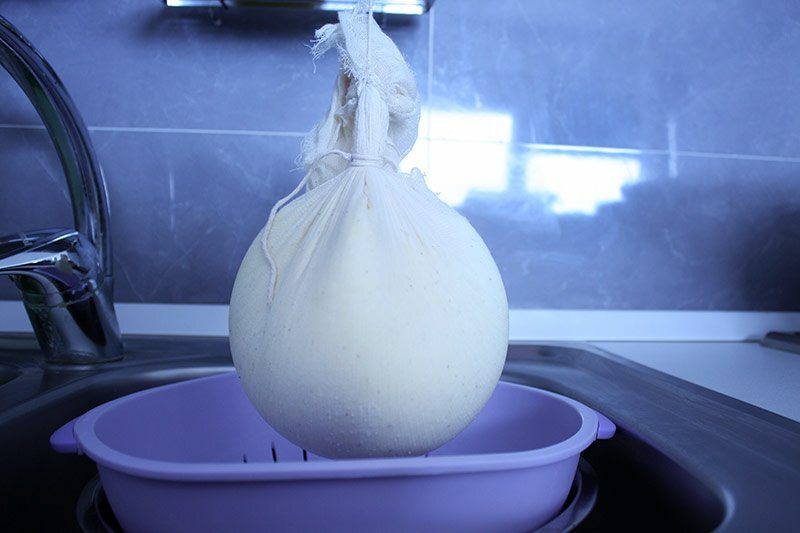 Make sure cheesecloth does not fall into the cheese. Gather edges of cheesecloth, and secure 2" above curd 'ball' using twine or string. Hang the curd from a faucet, cabinet handle, or a rack inside fridge above the colander to drain. Drain cheese for 1 1/2 hours. Resist the temptation to squeeze the cheese! The curds will get stuck in the cheesecloth, which makes it a lot more challenging to get it all out. Trust me, you don't want to lose any of this ricotta. Store in fridge for up to 3 days. For salty ricotta, add 1/2 tsp kosher salt per cup of ricotta. For sweet ricotta, add one tbsp sugar per cup of ricotta. Don't waste this on lasagna. I mean, it would certainly be a layer of pure ecstasy amongst hearty meat and tender pasta. Neighbors would line up at your door for a slice. It's just that this ricotta is so fabulous, it would be wise to let it stand on its own as the star. Spread on toasted baguettes, drizzle with olive oil, dab with pesto, crack some black pepper. Toss with al dente pasta, it will melt right in. Put it on a sandwich with roasted vegetables. Put it on a spoon and shove it in your mouth. Drizzle with honey and eat with fresh strawberries. Or make a cake. Stay tuned and sign up for the Nomad blog feed here. – Instead place a large coffee filter over a tea strainer/sieve. Pour curd slowly through it. – Use plastic wrap. Pull out a sheet the length of 'rope' you need. Scrunch it lengthwise to create the 'rope'. Create a knot at the top of the curd ball, then use remaining rope to hang the ball. Other good subs? Ribbon. I used a wire ribbon left over from a present. Reserve 8 c (2L) of the whey and combine it with 1 qt (1L) goat's milk. Repeat ricotta-making process. Will produce an additional 1 to 1 1/2 cups of ricotta. thanks for the suggestion Monique! I'll have to look for it in the store and give it a try. You can't beat 3 minutes!